Written on a rainy day under a dark and gloomy parisian or londoner sky, after a week disrupted by snow and ice within three days of spring.Will this editorial boost your mood ? 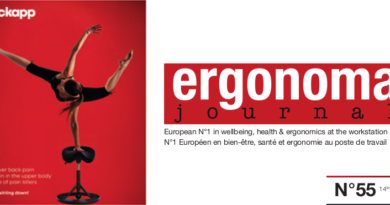 It is my dearest wish, as I like to share with you in the pages of this new issue, all these sparkling colours that have punctuated my stays at the Ergonomics Village in Paris within Expoprotection, at the Stockholm Furniture & Light Fair 2013, or in Birmingham for “Health and Wellbeing @ Work”. Away monochromic and monotonous offices, “drawn” on a line. The office designers and manufacturer of industrial equipment and office furniture did well to pass on the word, but will they be heard? : Will companies dare to be “out of the box” ? And yet, it is now that we managers, employees and service providers must be ready for it. An industrial or tertiary interior layout, as well as “at home, reflects prevailing personality, spirit and atmosphere. It is the cursor of the dynamism it decides to show or not . Whether you’re a techie or nature lover, or even a supporter of “less is more”, you will find in Ergonoma Journal the major market trends for a better life and a good health at work. Some accessories will make you smile: the “bowler hat”, very “Londoner” table lamp created for Innermost by Jake Phillips, to illuminate a work station at Kinnarps. Or the traditional acoustic screens with multiple possibilities and colours such as “PLAID” by Form Us With Love (Stockholm design studio) for Abstracta. But also smarter designed and colourful equipments with a natural ergonomic workstations integration approach which is the topic of this issue exceptional “Focus”.